Tennis specialist Craig Vickers (@craigvickers_) previews day eight of the men’s Australian Open and provides us with his best bets. 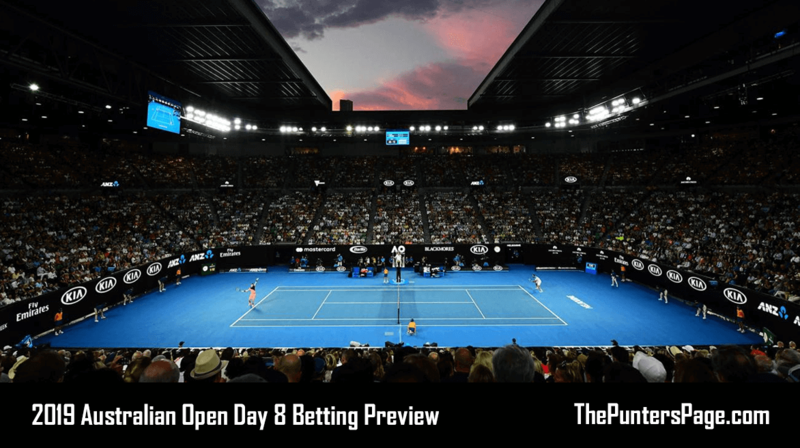 Monday marks day eight at the 2019 Australian Open as we conclude fourth round action in Melbourne. We had to wait until the seventh day, but we finally landed our first winning double of the tournament. First, Frances Tiafoe not only covered the +4.5 game handicap against Grigor Dimitrov but he stunned the Bulgarian in four sets, advancing to the first Grand Slam quarter-final of his career. 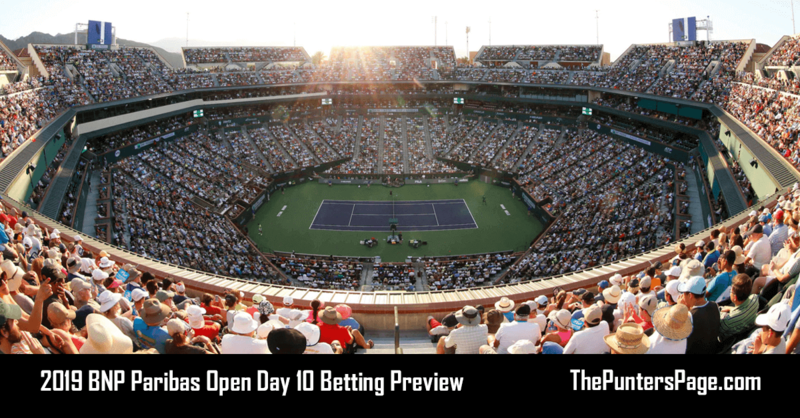 Then later in the day Roberto Bautista-Agut ended his fourth round hoodoo at the majors by defeating last year’s finalist Marin Cilic in a deciding set – his third match that has went the distance this tournament – to score us an 11/10 winner. Moving on, however, and the top half of the draw contains several intriguing ties, including the top seed Novak Djokovic’s clash with Daniil Medvedev on the Rod Laver Arena night session. And it is the Serb’s clash with Medvedev which could spring value, with the Russian capable of pushing Djokovic to the limit. Medvedev has yet to drop a set in Melbourne this year – unlike Djokovic – and he overcame a significant hurdle by reaching the second week of a Grand Slam for the first time in his career with his win over David Goffin in the previous round. The pair have never met on outdoor hard in their career and the Russian isn’t the type of player to surrender if he finds himself down an early deficit. Djokovic played solid through two sets of his clash with Shapovalov in the third round – winning 75% of his first serve points – but his concentration wavered at the tail-end of the third set, with Shapovalov striking his way past the Serb to claim the third set. Medvedev’s consistency from the baseline despite hitting so flat off both wings is incredible and even if defeating the Serb in his current state in Melbourne is a height too large to scale, over 3.5 sets at 5/4 represents good value. Alexander Zverev, meanwhile, is gunning to reach only the second Grand Slam quarter-final of his career when he meets Milos Raonic at around 2:30AM GMT on Rod Laver Arena. The Canadian defeated Zverev at the same stage at Wimbledon two years ago despite the German having led by two sets to one. Those of the belief a new year has signalled the start of better fortunes for Zverev at the majors will have been disappointed with how he responded to missing several opportunities to wrap up his match with Jeremy Chardy in straight sets. He was stretched to a deciding set by the Frenchman and the straight sets win over Alex Bolt in the previous round will act as relief, but Raonic is a considerable step up in class. The Canadian looks back to his shuddering best and showed signs of his old-self in his four set win over Stan Wawrinka in the second round. Most importantly, he looks healthy and unencumbered by niggling injuries – as has so often been his downfall in the last few years – and he has experience of navigating his way through the latter stages at the Australian Open. Injury befell him in the semi-final of the event in 2016 when he led Andy Murray by two sets to one so all things considering, Raonic to win at evens is worth a flutter. Our quarter outright Borna Coric is a 1/3 favourite against France’s Lucas Pouille and rightfully so considering the Croatian looks in fine form. Like so many other youngsters, Coric has never reached a Grand Slam quarter-final, but he certainly approaches the match the more rested player, with Pouille being stretched to a decider by the Australian youngster Alexei Popyrin on Saturday. Kei Nishikori, meanwhile, faces Pablo Carreno-Busta for the first time in his career and he should have too much for the Spaniard, with his kryptonite Djokovic potentially waiting in the quarter-final. 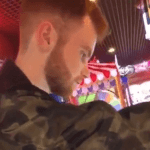 19-year-old writer from Scotland specialising in Tennis. Love nothing more than watching Andy Murray dumbfound his opponent with a lob. Sports journalism student who loves nothing more than day one of Grand Slams and sourcing ATP Challenger streams.